Adoption Profile - Adoption Story - Hopeful adoptive parents, Christa and Wayne, wish to adopt a baby. We are both from the Midwest and met while students at Indiana University. Go Hoosiers! A mutual friend brought Wayne to see a play Christa, a theatre major, was performing in. Christa was smitten right away by this tall guy with wavy hair and a mischievous grin. After graduation Wayne went off to Germany and Christa to Chicago. We reconnected nine years later when our dear friend who introduced us tragically passed away. Wayne was now living in the Catskill Mountains of New York and we visited each other for several years and wrote long emails before realizing that it was time to be in the same zip code! Christa took the plunge and traded in the Chicago Bears for Black Bears and moved to be with Wayne. We held our wedding on the campus of Indiana University where we first met surrounded by the ones we love and lit a candle in honor of our dear friend who brought us together. Wayne’s father (a pastor) officiated the wedding. We have now been married for 10 years! We have a sweet home in the mountains with lots of land to explore and a very close circle of friends who are so excited for us to adopt a baby. Christa is an actor and producer and gets to work from home (sometime in her PJs), producing corporate events and videos, independent films, and documentaries. As a professional actor her big love is theatre and she is an ensemble member of a theatre company that along with producing shows, also works in high schools with anti-bullying workshops and has a wonderful summer youth workshop for kids. Wayne is a senior software engineer developing mobile applications and database-driven web sites. Wayne enjoys being a mentor to the young interns who work in his office. He also has the flexibility of often working from home, usually with a cat curled up next to his computer. Together we enjoy cooking and exploring the area...taking back roads just to see where they go. And we can not wait to take family trips with our child. We both have great memories of family vacations and we can't wait to pack up the car and head around the US to see the sights and show our child national parks, historic sights, oceans, small towns, big cities, regional foods and fun oddities on the way. Christmas we will be back in the Midwest to visit our families and summers will be visiting friends in Chicago or Wayne's extended family in Florida and spending days on the beach. We plan to put a lot of miles on our car and always stay at a motel with a pool! Christa especially loves holidays and always tries to do something to make them special whether it be an Easter egg hunt for her friend's kids or making Irish Brown Bread and Fish Chowder for friends on St Patrick's Day. She loves wrapping presents and sending out cards at Christmas and grilling (Wayne's specialty) on the patio for the 4th of July. She admittedly can go overboard sometimes, as Wayne watches her bounce around the house getting ready for a holiday or event! We can't wait to plan birthday parties for our child and bake his or her favorite cake. Christa staying up late sewing a costume (just like her Mom did) and carving pumpkins and going on local hay rides at Halloween. And there will be lots of fun frosting heart shaped cookies at Valentine's Day. We plan to make holidays a special time for our child and create great memories for him or her. We like to joke that we live in a postcard. 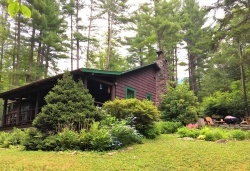 We are in the heart of the Forever Wild Catskill Park, surrounded by forests and streams. We spend as much time outside as possible. Wayne likes to use the front porch as his home office (he is a software developer), even if he has to wear a wool cap while doing it. Christa (who is both a producer and an actor) has been known to take a conference call while weeding the gardens. She memorizes lines for the plays she is in while taking long walks on country roads. In the summer we enjoy eating our meals out on our patio and love to watch the stars come out and the bats race around catching mosquitos in the night sky. Christa takes care of the garden and yard while Wayne has a wood working shed that he likes to create things in, like a pot rack and recipe book shelves for our kitchen! We want to share all of this beauty with a child, teaching him or her to love and have fun in nature. Our town (voted best small town in America) has a charming Main Street and every time you go to the post office you run into at least three people you know! The library in town is amazing and always buzzing with activities for kids. There is a nice park with the mountain rising up all around it. Our elementary school has a very active school board that strives to make it a safe and creative place to learn. There is a huge international music festival in Phoenicia each summer. The community is safe, neighbors look after each other, and most people don't even lock their doors (which was amazing to Christa after living in Chicago!). Our home is nestled on the side of a mountain, about a mile from the village center. We are surrounded by woodlands and we have a little wildlife pond that we look forward watching tadpoles, turtles, lizards and frogs with our child. We can’t wait to take our child on hikes in the summer, snow shoeing in the winter and watching stars come out at night. Wayne is good at skiing and will enjoy taking our child to their first lessons at the local ski mountain. Christa has talked about being a mother since I have known her back when we were friends in College. I have no doubts that she will be a great mom and role model for our child (just as Christa’s parents are for her). She will provide a safe, loving presence for our child. My wife is amazing to observe. She never stops trying to accomplish things and makes our life and home as nice as it can be. She has sewn curtains, recovered pillows, made cushions for outdoor furniture, repainted and stained old furniture, and hunts down great antique and 2nd hand fines for us. She enjoys her work as a producer and loves being an actor (It's very special when I get to watch her on stage). She is a natural care giver and gives me, her friends, family and pets as much love and support as she can. She has a big laugh and enjoys being silly. She makes time daily to exercise, yoga, hiking, running...and I know she looking forward to getting a baby jogger so she can run with our child. And she is a sucker for old fashioned murder mysteries and usually falls asleep at night with a book on her chest. She is going to be a fabulous Mom. Christa's thoughts on being a mom: I have always wanted to be a mom. I have been fortunate to have a terrific Mom (who is really looking forward to spoiling a grandchild!). My Mom and I are so close to each other and I have always wanted to give that same love and support to my own child. I can’t wait to love, teach, care for, play with and discover the world all over again with a child of my own. I most look forward to taking our child to children’s theatre performances like my Mom did, walking in the woods and teaching him or her about the various plants and animals that we see. And I really want our child to feel strong, comfortable and confident in their body so I look forward to doing lots of physical activities with them, like playing in the park, getting involved in some type of sports, dance activity or yoga. I have a really close-knit circle of friends who are a HUGE support to me and who are sooooooo ready to be aunts and uncles. Our child will get LOTS of attention and love. Wayne is going to be a great Dad, especially when it comes to teaching our child to read, study, think and question. When Wayne gets curious about a topic he becomes incredibly focused on learning everything he can about it. It can be about cooking. He makes great, hot sauces, pickles, bread (I thought I would gain 10 lbs. when he started baking fresh bread everyday perfecting his technique). Or about things more practical like how to fix the snow blower or washing machine. His curiosity is amazing and he is a self-proclaimed news junky. Plus, he has a goofy sense of humor and will make up silly lyrics to familiar songs to make me laugh. Even though he can come across as the quiet stoic type, he is also very sensitive and will tear up while watching classic movies like The Wizard of Oz or The Sound of Music..although he will deny it, if you ask him. I cannot wait to see Wayne become the doting father that he is looking forward to being.